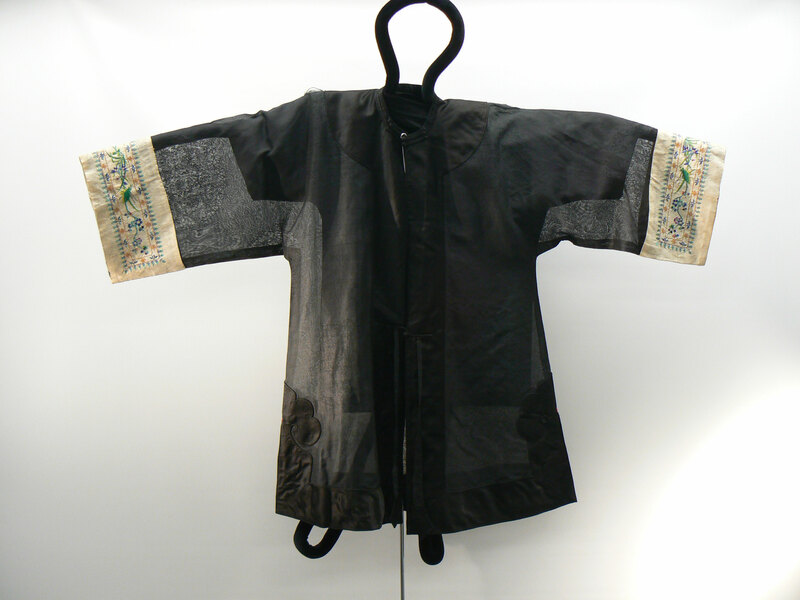 BLACK HAN CHINESE WOMANS SEMI-FORMAL SURCOAT. The main body of the coat is black silk gauze and contains pattern of large circle medallions with two rearing dragons. There are two strips of black silk satin ribbon form a collar and a wide silk satin yoke lies around collar over the shoulders, continuing on either side, down the middle front of the garment. It continues in a border around the base. There are two black satin button knots at the collar and midway down the coat is another Chinese button knot and black gauze sash ending in silk satin diamond shapes. There are slits on each sid of the coat at the bottom and stitching in red thread closes the slit at the top. There is a satin bourder cut into a decorative cloud shape around the slits. Wide cream silk cuff on end of sleeves has a woven pattern and is embroidered in many bright colors, using satin stitch. The patterns include bright green and yellow grass hoppers and birds clinging to a vine of flowers, which may be plum blossoms, mostly in a variation of blue and purple. The border around the images creates a band around the sleeves in little turqoise leaf shaped flowers. The border is couched gold thread on either side of a pattern of alternating blue iris blossoms and Chinese knots of infinity. Coat is in poor condition, with holes on top of each shoulder, border on sleeves frayed at folded edges, cuff on right sleeve is pulling away from rest of sleeve, and a pink stain on the right cuff.